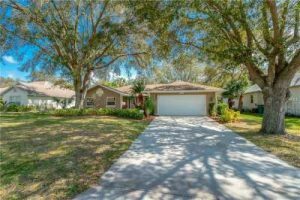 Stunning 4 Bedroom, 3 Bath Deep Creek Home located at 2060 Nuremberg Boulevard, Punta Gorda, Florida. This is a stunning 2,000 sq. ft. 4 bed, 3 bath home on a premiere Deep Creek lot with 350 + feet of greenbelt preserve in your backyard! Launch your kayak into Lake Constantine! This home was completely remodeled in 2011 and heated pool by Casa pools added in 2012. Another update was $40,000 in impact doors and windows installed in Nov 2018 w/ transferable warranty! Complete interior freshly painted in 2019. 20 ” Porcelain tile throughout the entire home, Beautiful kitchen with wood cabinets, 36″ uppers with custom glass, crown molding, granite counters, light rail, stainless appliances, water filtration and built-in buffet in dining area. Large Family room includes a wood burning fireplace accented with marble base and stone mantle. Even more are 2 dozen recess cans throughout. The bathrooms are tastefully appointed with tiled showers, decor accents, marble floors, wood vanities, granite counters and two have Jacuzzi tubs. Master has custom walk-in closet, master bath has separate Jacuzzi tub and shower. Master bedroom and family room have new impact French doors to the lanai and pool area. Most noteworthy is the heated pool with tranquil landscaped waterfall and large 20″ porcelain tiled lanai. This home has been impeccably maintained. Mature Oak trees are great for shade. The yard is well landscaped and irrigated with a 5-zone sprinkler system. Public water and sewer throughout this deed restricted neighborhood. Surrounded by quality homes and just a few minute drive to shopping, Kings Hwy and I-75. Make an appointment to preview this beauty today!